Please join us for the winter edition of our popular What's in Your Pack class. 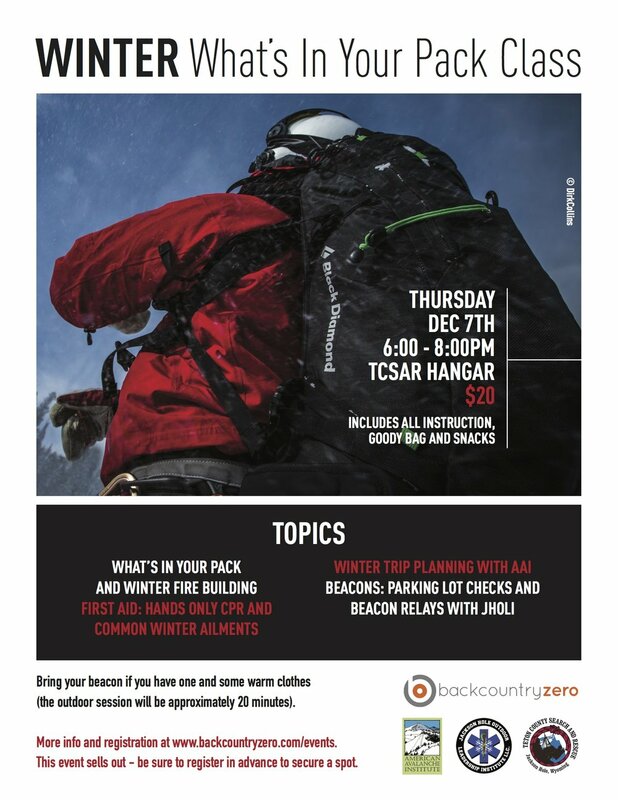 A host of new topics featuring TCSAR volunteers and local pros teaching essentials for the backcountry. This class sells out. Sign up today to secure your spot. Each participant will receive a goody bag. The class will be held at the TCSAR Hangar (300 South Batch Plant Rd) on Thursday, December 7th from 6:00 - 8:00pm. Class is $20 and includes a goody bag and all instruction. Please arrive a few minutes early to get parked and checked in. Please bring your beacon if you have one and some warm clothes. The outside session will last about 20 minutes.